Remember the days when following Jesus was easier? Whether you’re a student, practicing professional or somewhere in between, a life in healthcare makes it hard to pursue Christ with your whole heart. Let alone look around you to serve others. If you’re like most, you want to keep growing in your relationship with God. But it can feel overwhelming, and it’s easier to do the minimum, hoping it all gets better ‘someday’. Deep down, though, you know that ‘someday’ won’t be any easier. If you’re going to pursue God, you’ve got to get started now, even when life is crazy. 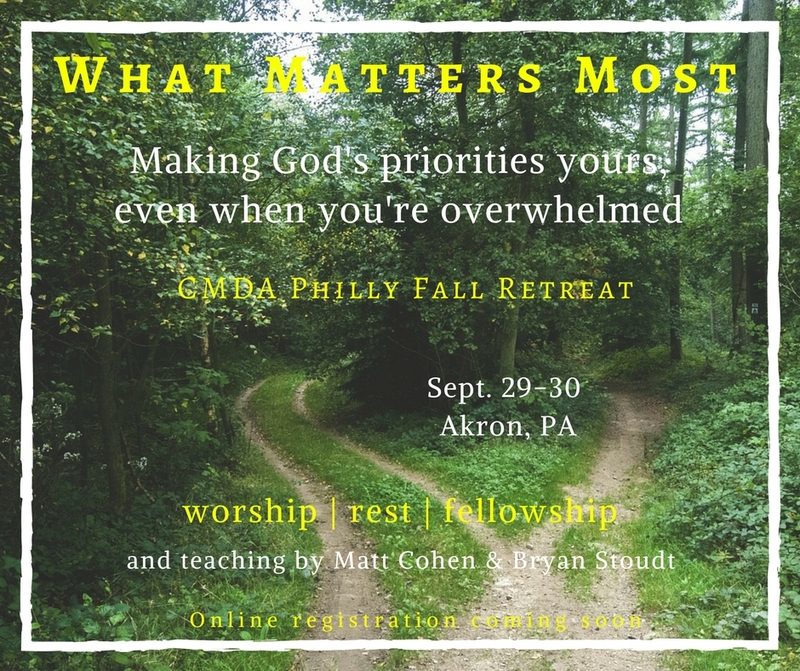 That’s what this year’s CMDA Fall Retreat is all about. We’ll provide a simple, biblical framework for following Jesus so that you’ll know how you’re doing, and, where you need to keep growing. And we’ll do it together, in community, with others who understand what you’re going through. Our time away will help you reconnect with God and other believers, and refresh your sense of calling to serve Christ through healthcare. We hope you’ll join us! Contact information: Sharon Stoudt: stoudts@gmail.com; 856.524.2125. Speaker Information: We will have a panel of various local professionals with us, and we hear teaching from God’s Word by pastors Matt Cohen and Bryan Stoudt. Schedule: We’re still putting finishing touches on the schedule, but in addition to our main sessions and panel, we’ll have plenty of time for rest (study if you must! ), refreshment and fellowship. Price includes 4 meals. Linens, towels, etc. are also all provided. This entry was posted in events, retreat, Uncategorized by Bryan Stoudt. Bookmark the permalink.